The fact that it is BYOB compensates for the sometimes brutish attitude of the owner and staff at this small neighborhood haunt on rejuvenated 9th Ave. This tiny place seats only a handful of people at a time- so make sure you have a reservation if coming for dinner. 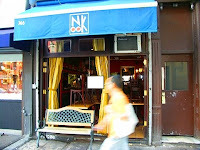 Local Hell's Kitchen residents have taken notice and it has become a neighborhood favorite. For dinner, the small quaint atmosphere can make it a bit romantic, but the tight quarters make getting along with your neighbors essential. Favorite dishes include Black Angus Steak with peppercorn and Sashimi Peppered Tuna. Be prepared for choppy service and some attitude from the owner. It is not the friendliest place - which is odd given I usually find smaller places to be warmer in general. Go for brunch - usually it is less crowded, and service tends to be a bit more pleasant. The scrambles are delicious - my favorite is Bacon, chives & tomato. Love bacon, always, always a brunch must-have. Also- It is cash only - or at least was cash only the last time I was there.